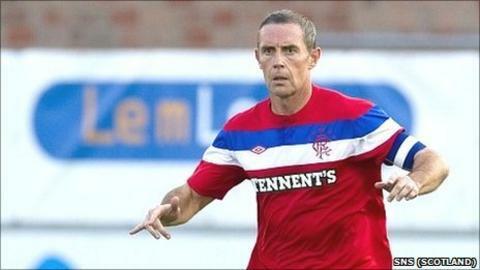 Rangers manager Ally McCoist has secured the services of veteran defender David Weir for another season. The Ibrox captain, 41, made more than 50 appearances last season but had been taking a coaching course to prepare for the end of his playing career. Weir, whose family live in England, said: "I can't think of a better place to play my football. "I've got commitments to my family and from that point of view it's not ideal, but football-wise it's a no-brainer." Earlier in the year Weir had hinted that he would welcome a coaching role at Everton, a club he played for and one close to his family home. But he was convinced to sign by McCoist, who warned him that he will face a challenge to secure a starting place. "This is the place I want to play and as long as the manager thinks I can still do a job then I'm happy to sign here," Weir told the Rangers website. "The family thing is obviously a consideration but it works well for me at the moment because I have a good balance. "The manager was honest and told me that he was trying to get players in and that there would be competition, but I welcome that. "You want a challenge to keep you on your toes and make sure you are always striving to perform at your best." Rangers have agreed a fee with Aston Villa for Carlos Cuellar but must now try to agree personal terms with their former defender. Weir partnered Cuellar for one season before the Spaniard left for Villa Park but in their time together the duo helped Rangers to the Uefa Cup final in 2008. "He's top class," said Weir of the Rangers target. "He was only up here for a season but everybody saw how good he was that year so we'd obviously love to have him back. "People know what we would be getting with Carlos, there is no real mystery to it and that is a big thing in favour of the move. "It's definitely an area the manager is looking to add to and if we want players to improve the squad Carlos is certainly one that would fit that bill."